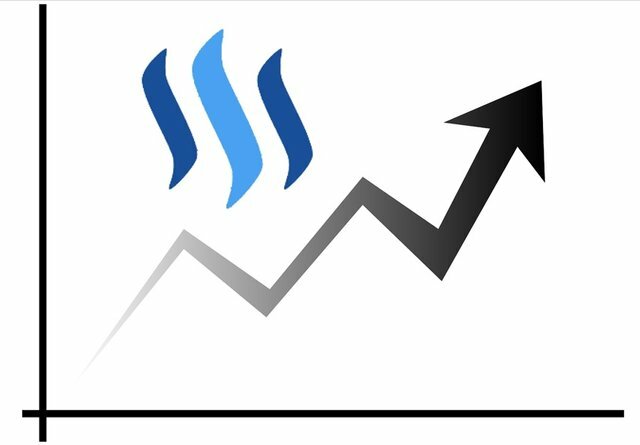 Is the STEEM Price rebound over? What's next?? Just to share where I see STEEM/BTC pricing at the moment and where it can go next. For direction, i look out for signs of divergence in price vs chosen directional indicator to identify possible price reversal. Probability of price reversals - i will look for signs of price exhaustion in current trend using strength and momentum indicators. For entry and exit points, i will use historical trade volume profile and fractal support and resistance levels to pinpoint these. Price has rebounded from 0.009 lows at 0.00116 levels. 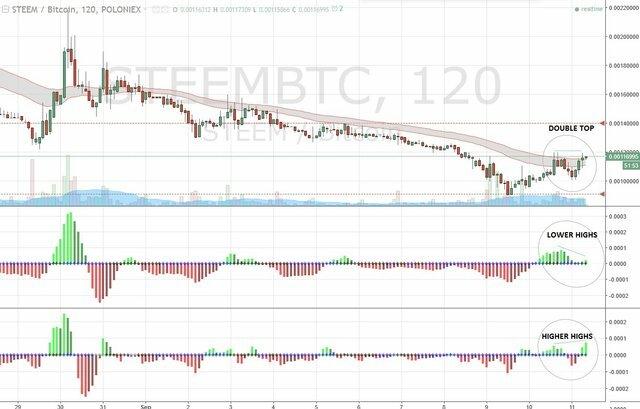 At the moment, we see STEEM/BTC failed as yet to perform a new higher high, resulting in a double top in price action instead. I also note that divergences in both short and medium term directional indicators infer a possible bearish price reversal coming up. 1st of all, price has moved above the slingshot cloud in the 2 hr time frame. This reflects substantial support below which will be more challenging for any price reversals. In terms of relative strength wise, price has moved up from previous oversold territory back to the neutral zone rather than all the way to the overbought area above that. That could mean current uptrend has not been fully exhausted and could continue this uptrend, hence lessening the chance of a price reversal for now. Conversely, the last momentum indicator has stayed in the red zone throughout this whole rebound, which also means any further rally could be capped. 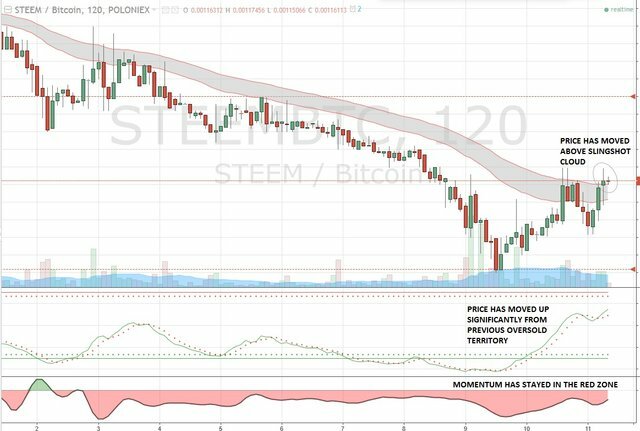 Bottomline : STEEM/BTC may be stuck in a tight range-bound consolidation in the immediate term rather than heading higher or retracing back to a new low. 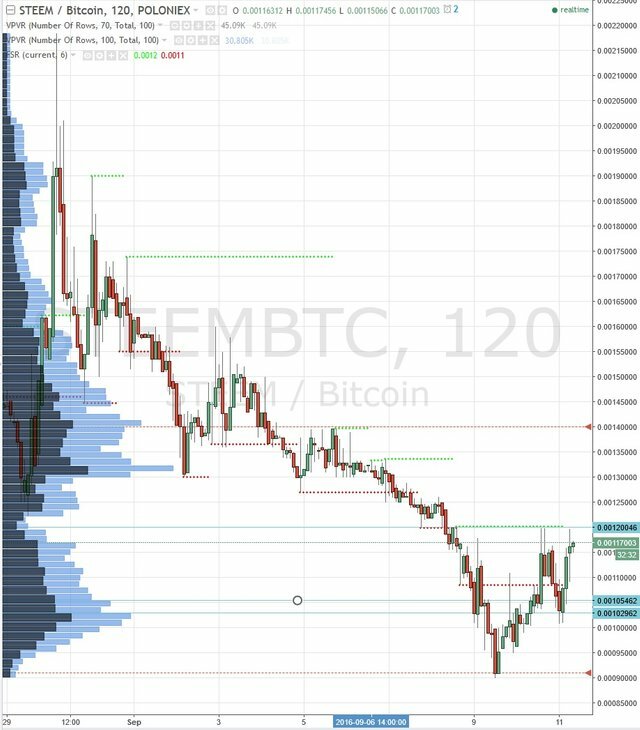 Based on historical trade volume profile and fractal support and resistance levels, near term resistance is at previous double top highs of 0.0012 (this needs to be exceeded on a 2hr close convincingly with decent volumes dealt for STEEM/BTC's uptrend to continue higher). If I were shorting STEEM/BTC (if shorts were feasible), a level slightly higher than that would be appropriate as a stop-loss level. Near term supports are 0.00105 and/or 00103 levels. These would be appropriate shorts profit-taking or entry levels for longs provided earlier divergence indicators and probability of reversals are all in line for the respective trade at that time. In terms of disclaimers: these are just my own views and I will not be responsible for any trades that you may end up taking based on that. You are ultimately responsible fully for all your trading actions. In terms of disclosures: I currently have a long STEEM/BTC position which i may look to partially reduce if the price reversal probability as mentioned earlier increases. I think it's going lower.